Gabe Fuentes expects to spend his summer the way he usually does: helping with his toddler siblings; taking care of his pet iguana, fox, and parrot; and building model rockets with his best friend. 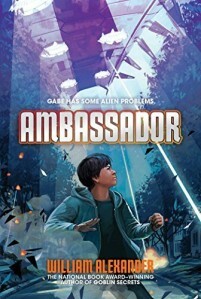 But his plans change drastically when a purple creature known as the Envoy invites Gabe to become Earth’s Ambassador to the Galaxy. He learns about alien communication, is targeted by alien assassination attempts, and discovers that a destructive alien force is headed toward Earth. Then things get more complicated when he finds out that his undocumented parents are in danger of deportation. Can Gabe survive long enough to solve two sets of alien problems? He runs for his life, through Minneapolis and Outer Space, in an otherworldly adventure from National Book Award winner William Alexander. Signed and personalized copies of Ambassador are available from Bear Pond Books. Unsigned copies can be purchased in all the usual ways from IndieBound, Powell’s, Barnes & Noble, and Amazon. Enter Nadia. She was Earth’s Ambassador before Gabe, but left her post in order to stop the Outlast. Nadia has discovered that the Outlast can conquer worlds by traveling fast through lanes created by the mysterious Machinae. No one has communicated with the Machinae in centuries, but Nadia is determined to try, and Gabe and Kaen want to help her. But the three Ambassadors don’t know that the Outlast have discovered what they are doing, and have sent assassins to track them down. –Jane Yolen, Aesop of our era. 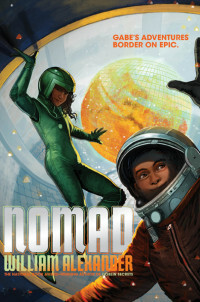 Signed and personalized copies of Nomad are available at Bear Pond Books.